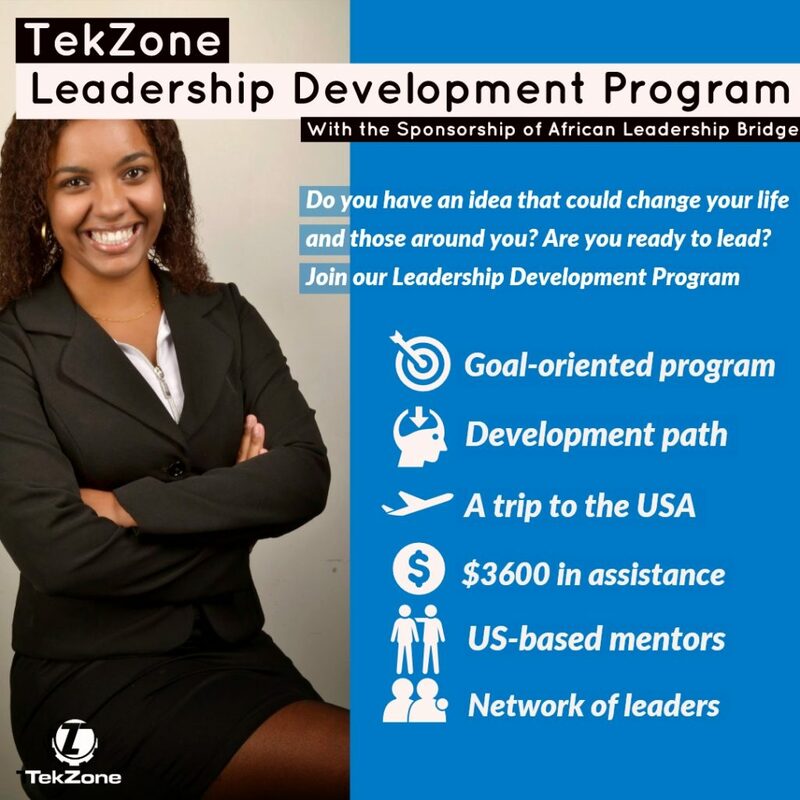 In Partnership with The African Leadership Bridge TekZone is launching a Leadership Development Program tailor-made for young Africans. Step 1: set a SMART 2-year goal with measurable impact. Step 2: create a precise development plan with milestones and assign an experienced accountability mentor to help ensure we remain on track. Step 3: execute on the development plan through a variety of activities including courses, assignments, discussions, events, book groups and others. This includes the possibility of a 1-week trip to the USA for further development. Have a great idea that can result in the creation of jobs, improve work environment or a positive impact in your community. Proficiency in reading, writing, and speaking English is preferred but not required. Fully commit to the program if selected. This include making time for your development and the requirement to reside in Africa for the full length of the program. Option 1: Signup and take the Leadership Fitness Test on TekZone Academy. We will reach out to you if you are selected after taking the test. You can use the following key to have access to the test: “tekzoneldp”. Option 2: current staff or alumni or TekZone or one of the participating partners and sponsors can nominate you. Option 3: signup for classes at TekZone. This allows our team to get to know you better and increases your chances of being selected. The African Leadership Bridge is championing the next generation of African leaders through sustainable scholarships and a strong support network to provide the tools and experience needed to drive change in the African continent. Established in 2006, African Leadership Bridge has worked with the African Leadership Academy to identify promising African students with a strong entrepreneurial drive and a dedication to the transformation of the African continent through hard work and leadership.